There’s a brand of subway movie poster defacement, particular to this city, which I very much enjoy. It isn’t as overtly political as some I’ve observed in San Francisco, and cuts to the chase rather nicely. Here we see an advertisement for the new Ron Howard film – reason alone to go at it. Vince Vaughn’s eyes have been removed, along with the entire face of the fat guy from The King of Queens. 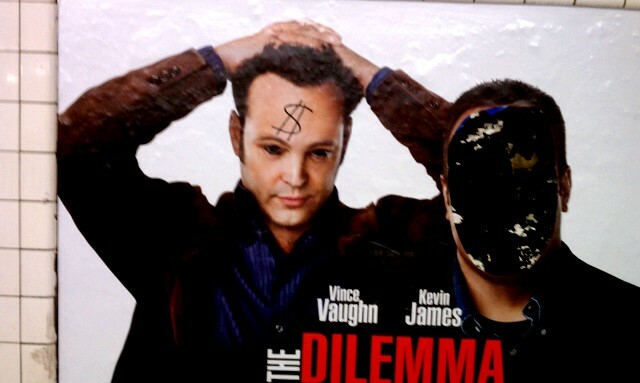 I’m not sure what the dollar sign on Vaughn’s forehead is all about .. perhaps someone visiting from San Francisco. Just next to this poster was one for No Strings Attached, a new romantic comedy starring Ashton Kutcher and Natalie Portman. Someone had simply written “NO” next to Kutcher’s image with a big Sharpie, proof positive that less is more and minimalist writing is not dead. I couldn’t have put it better myself, and wondered if it was the same person who had written “Are you kidding me?” next to Chris O’Donnell as he stood next to LL Cool J on a ad for NCIS: Los Angeles some months back. As for Portman, I’m not sure why she felt it necessary to follow Black Swan so quickly, and team up with a guy who’s now best known for his COOLPIX camera gigs. I saw Swan last month, and can attest that the girl-girl scene alone was suited for indefinite mental lingering. This was written by admin. Posted on Friday, January 14, 2011, at 3:34 pm. Filed under Posting. Bookmark the permalink. Follow comments here with the RSS feed. Post a comment or leave a trackback.